Hello Summer we all cried just a week or so ago as we lolled around in sandals and packed our trusty jumpers away. And then it seemed I had blinked and seven months had passed for we had snow ……. yes snow and hailstones. Surely it must be December? In the narrow chink of loveliness mini GT and I spent some lovely time in our garden. We have a smallish paved noisy garden next to a big road but the nipper and I love it anyway. First we had the “melty cheese” experiment which involved putting a piece of cheese on a plate and sitting it in the sun whilst looking at it intently to see what it would do (it didn’t really melt much to the disappointment of mini GT) Then there was playing with the hose – it makes me a bit ashamed as I know there are people with no water to drink – but honestly 10 minutes of giving her free reign with a water hose is ten minutes of blissful peace! Then I decided to make home made ice lollies. 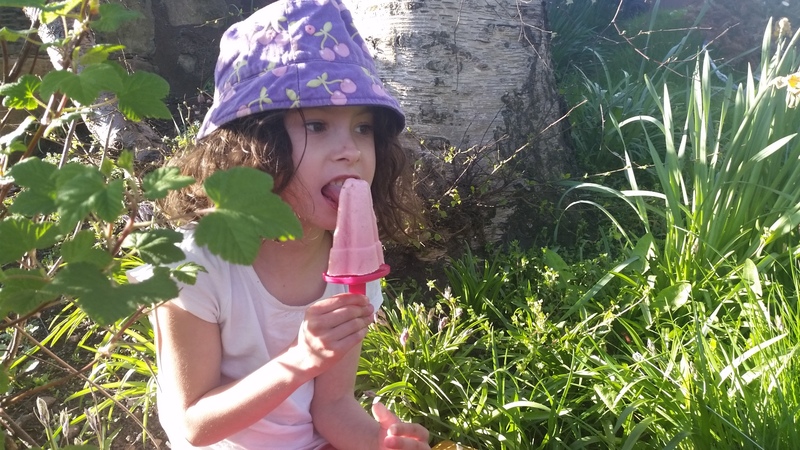 We had been told earlier in the week by the wee one’s dieticians that we were not to worry a jot about a healthy diet but rather just get little miss to eat whatever she wants to get her weight up BUT I reckoned I could kill two birds with one stone in some home made lollies. 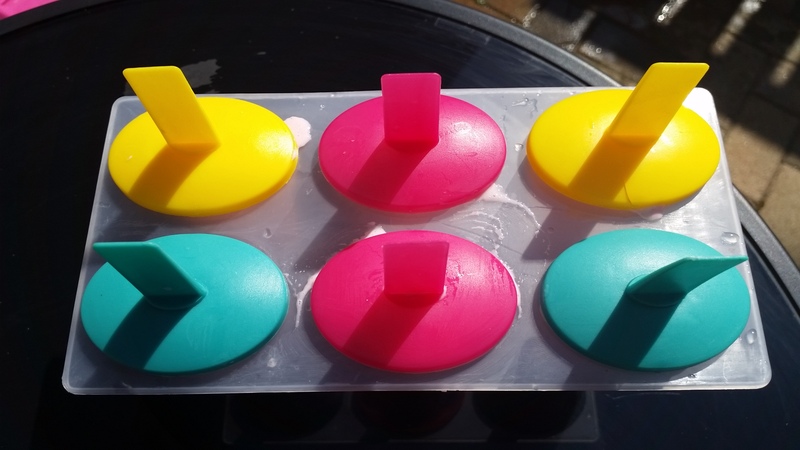 I picked up these cute lolly moulds from ASDA for the princely sum of £2. Into the blender I added a handful each of strawberries and raspberries, a spoonful of honey, a little bit of gold top super creamy milk and lots of full fat Greek yogurt. There are no real quantities, I just experimented till I had a smooth tasty mixture. In the moulds it went and into the freezer for about 4 hours. Now here is the trick – to get the lolly tray to actually give you your lolly you have to stick it in hot water for about a minute to loosen things off. The result was fantastic – I loved them as did my husband. But what did little Miss think? 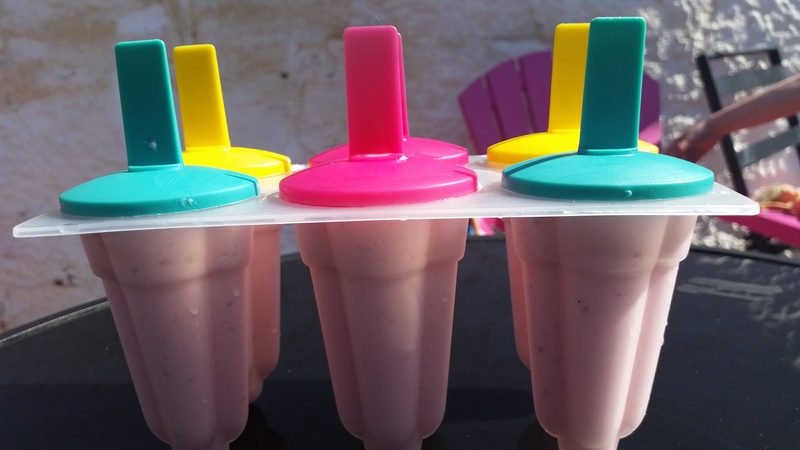 My next trick with the lolly mould will be nutella and banana lollies (that will trick her) and also coconut milk lollies with mango. You should give it a go as the possibilities are endless and lets face it they can keep in the freezer till the snow passes.